Hi. Thanks for visiting my blog! I hope you find it helpful and informative. 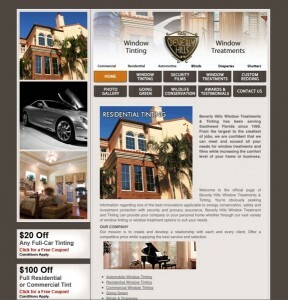 My company Beverly Hills Window Tinting & Treatments is a family owned and operated company, that has provided the residents of Fort Myers & Naples, window tinting since 1990. No matter how small or large your job is, we’re confident that we can meet and exceed all your needs for window treatments and security window films while increasing the comfort level of your home, business, or automobiles. We look forward to serving you in Cape Coral, Fort Myers, Sanibel, Captiva, Estero, Bonita Springs, Naples, Marco Island and all of Lee & Collier counties. For more information or if you need directions to our Fort Myers or Naples locations, please contact us online.